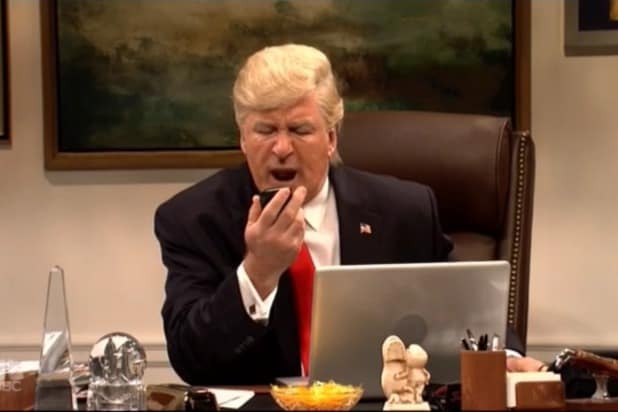 “SNL” was noticeably devoid of any references to the Harvey Weinstein scandal last week, but this week The show dedicated a sketch to that very topic. The sketch took the form of a panel of actresses at the Lincoln Center tackling the topic of sexual harassment in Hollywood, with Cecily Strong as Marion Cotillard, Leslie Jones as Viola Davis and Kate McKinnon as her recurring character Debette Goldry, a Golden Age Actress who had quite a choice anecdote to share about Weinstein. McKinnon’s Goldry kicked off the discussion with a monologue comparing back in the day to what’s going on in the world right now. Later, Goldry provided the anecdote I teased previously, in which she had a personal encounter with Weinstein. Goldry also described how women in Hollywood back in the day had a code phrase to talk about the various evil things men in power did to them.